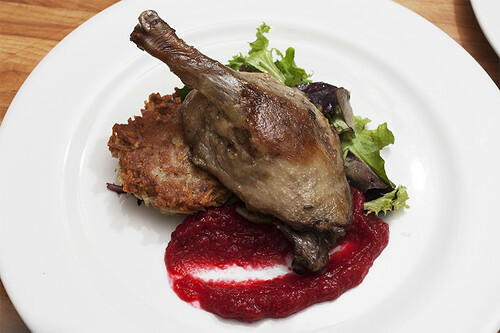 seared duck leg confit with a fresh cortland apple and cranberry coulis and red potato latke, originally uploaded by aarn! +6th December, 2010+. squeezed the liquid out of three peeled and coarsely grated small red potatoes, one peeled and grated russet potato, and a grated small onion, using a double layer of cheese cloth. removed the grated potato mixture from the cheese cloth and added to it 1 egg, 1T. of all-purpose flour, salt, pepper, and a splash of olive oil. mixed it all together. placed a 4-in in diameter patty of the potato mixture into a hot skillet containing 3T. or so of rendered duck fat. cooked on medium heat until browned and then flipped and repeated the process. peeled and cored two medium size cortland apples. blanched 3-oz of fresh cranberries in a few cups of boiling water, until the skin cracked on all of the berries. placed the apples and blanched cranberries in a food processer and pulsed until smooth. pulled from the refrigerator the two remaining duck legs which were confited (still not convinced that this is a word, no matter how many times it appears in print) and capped with fat after the post "pumpernickel and duck confit stuffing with braeburn apples and hazelnuts," prior to thanksgiving. reheated the legs and fat in a 250-degree oven until the fat was clear again. removed the legs from the fat and placed them skin side down in a hot cast iron skillet until the skin was crisp and brown. flipped the legs over, so that the skin side was up, and placed the skillet in a 300-degree oven until a cake tester came out warm when the thickest part of the meat was checked. plated the legs over a smear of the apple-cranberry coulis, some mixed greens (which were lightly coated with some seasoned rice vinegar, salt, pepper, and olive oil), and one of the duck fat fried red potato latkes. totally spaced out on the fact that there was delicious confit jelly which had been separated from the fat after the confit process. that would have been really great reduced and served over the legs. oh well.